This photo was taken by Barry Gooch, Field Coordinator for the Cooperative Research Program run by DNR. It shows how old crab pots could be recycled as a substrate for developing new oyster reefs. Everybody can do their part to ensure that South Carolina continues to have enough tasty oysters for generations to come. DNR runs the Oyster Recycling and Restoration Program, which provides oyster shells to replenish existing oyster beds. Without old shells to replenish existing beds, new oysters have nowhere to live. 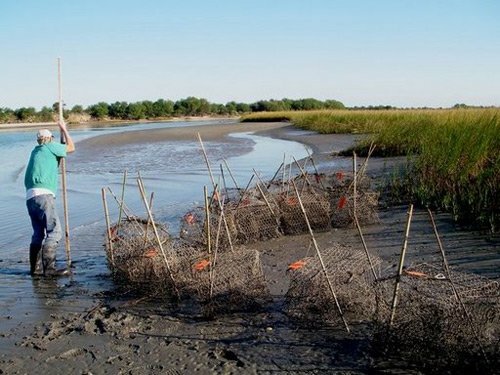 You can learn more about taking part in some great projects with the South Carolina Oyster Restoration and Enhancement Program (SCORE). As oyster shucking houses have closed along our coast, the natural cycle of collecting oysters, eating them, then returning the shells to the oyster beds has been disrupted. Oysters filter pollution from our water and provide protection against shoreline erosion caused by passing boats. Their importance to our coastal environment goes far beyond our plates. Learn more about the importance of recycling oyster shells and SC oysters. We purchased a home on St. Helena Island two years ago and the oyster beds were magnificent. Due to harvesting and Hurricane Matthew they are pretty much gone. I would like to know how you get on the list for oyster bed restoration. Thank you.